EXTENT: Satellite data shows Arctic melt sea-ice extent probably reached the minimum for the year at around 3.4 million square kilometres on Monday 17 September, 18 per cent less than the previous record in 2007 of 4.2 m.sq.kms. The JAXA daily raw data is here and the NSIDC date is here. This extent is now well less than half of the average extent of the 1980s. VOLUME: The sea-ice volume is now down to just one-fifth of what it was in 1979. Latest PIOMAS volume from September 3, 2012 is 3407 cubic kilometers of ice remaining in the Arctic. Contrasted with the 16,855 of 1979, that is just about 20 per cent. Extent has dropped further since 3 September, so minimum volume this melt season will be about 5–10 per cent less than the early-September figure. ICE-FREE ARCTIC: Debate rages within the scientific community. 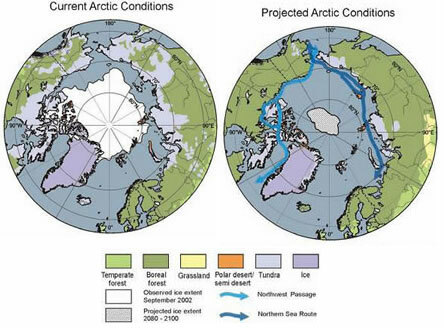 Previously we covered Big call: Cambridge prof. predicts Arctic summer sea ice “all gone by 2015”. 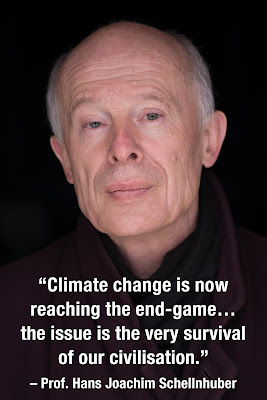 On Monday the Guardian reported "Arctic expert predicts final collapse of sea ice within four years", in which Prof. Peter Wadhams of Cambridge said: "I have been predicting [the collapse of sea ice in summer months] for many years. The main cause is simply global warming: as the climate has warmed there has been less ice growth during the winter and more ice melt during the summer… in the end the summer melt overtook the winter growth such that the entire ice sheet melts or breaks up during the summer months. This collapse, I predicted would occur in 2015-16 at which time the summer Arctic (August to September) would become ice-free. The final collapse towards that state is now happening and will probably be complete by those dates. As the sea ice retreats in summer the ocean warms up (to 7C in 2011) and this warms the seabed too. The continental shelves of the Arctic are composed of offshore permafrost, frozen sediment left over from the last ice age. As the water warms the permafrost melts and releases huge quantities of trapped methane, a very powerful greenhouse gas so this will give a big boost to global warming." Unforntunately, the eviednce is on his side. The Arctic sea-ice big melt of 2012 “has taken us by surprise and we must adjust our understanding of the system and we must adjust our science and we must adjust our feelings for the nature around us”, according to Kim Holmen, Norwegian Polar Institute (NPI) international director. From Svalbard (halfway between mainland Norway and Greenland), the BBC’s David Shukman reported on 7 September that Holmen had described the current melt rate “a greater change than we could even imagine 20 years ago, even 10 years ago”. As detailed last week, the thin crust of sea-ice which floats on the north polar sea is now only half of the average minimum summer extent of the 1980, and just one-quarter of the volume twenty years ago. Yet the IPCC 2007 report suggested sea-ice would last all, if not most, of this century: “in some projections using SRES scenarios, Arctic late-summer sea ice disappears almost entirely by the latter part of the 21st century”. One modelling image in the IPCC report (below)shows sea-ice still existent in period 2080-2100. This has proven to be dramatically conservative. "As a scientist, I know that this is unprecedented in at least as much as 1,500 years. It is truly amazing – it is a huge dramatic change in the system”, says the NPI’s Dr Edmond Hansen. It is “not some short-lived phenomenon – this is an ongoing trend. You lose more and more ice and it is accelerating – you can just look at the graphs, the observations, and you can see what's happening." And the trend is clear. Cambridge Professor and Arctic expert Peter Wadhams predicts Arctic summer sea ice “all gone by 2015”, except perhaps for a small multi-year remnant. Other Arctic specialists are now saying we will see an ice-free Arctic in summer within a decade or so. Clearly the IPPC 2007 report is no longer scientifically adequate on the Arctic – and much else – and Holmen’s call to “adjust our understanding of the system and… adjust our science” is timely. 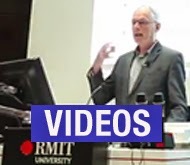 The nub of the problem is that climate policy-making in Australia, and internationally, is stuck in the IPCC 2007 frame and is thereby disconnected from what is occurring on the ground, in the seas and at the poles. For that reason it can only fail. The IPCC 2007 report dramatically underestimated sea-level rises to 2100, as being in the range of 0.18–0.59 metre this century, “excluding future rapid dynamical changes in ice flow”. Because ice sheet melting and carbon-cycle feedbacks such as permafrost are non-linear or difficult to model, the IPCC report projections “do not include uncertainties in climate-carbon cycle feedbacks nor the full effects of changes in ice sheet flow, therefore the upper values of the ranges are not to be considered upper bounds for sea level rise.” The use of paleo-climate (climate history) data as a guide to future sea levels, as advocated by researchers such as James Hansen of NASA, was excluded. Four of six emissions IPCC scenarios found the “best estimate” of warming to 2100 to be at or below 2.8°C, whilst the trigger for substantial Greenland ice mass loss was put at at 2.7°C with a range of 1.9-4.6°C, “if global average warming were sustained for millennia” (my emphasis). Arctic sea-ice unlikely to be lost until the end of the century, or later. No clear evidence as to whether polar ice sheet melting would accelerate, and in any case the trigger point for Greenland was close to 3°C (implicitly perhaps a century away). Hence low estimates given for sea-level rises, based on a linear pattern of polar melt. Dynamic and accelerating melting was noted as a possibility but not quantified, effectively rendering it as a footnote. 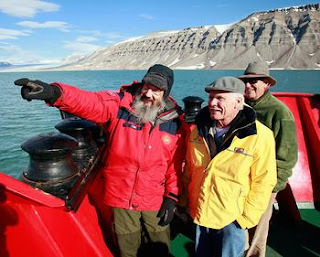 The language of “tipping points” was not deployed, and the strong implicit message – for the Arctic, Greenland and sea-levels – was that tipping points were not likely in next few decades, and some would play out on millennia time scales. With the world aspiring to hold warming to 2°C, there is time enough to stop really bad things happening. So even for the developed, high-polluting (Annex 1) countries, warming could be held to 2°C so long as they reduced emissions by 80 per cent by 2050; for other countries the target was as vague as “substantial deviation from baseline”. Still polluting in 2050 was OK, because the very bad things weren’t going to happen till well after that. Climate changes and impacts happening more quickly and at lower temperatures than expected, such as Arctic sea-ice which is in a “death spiral” and likely to be gone in summer within a few years. The tipping point for Greenland has been revised down to 1.6ºC (uncertainty range of 0.8-3.2ºC) above pre-industrial, just as regional temperatures are increasing up to four times faster than the global average, and the increased heat trapped in the Arctic by the loss of reflective sea-ice ensures an acceleration in Greenland melt rate. 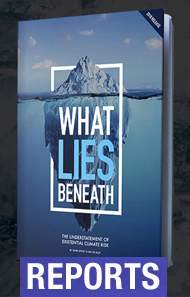 Significant tipping points have been already crossed and others are imminent, with particular concern for coral reef systems and the West Antarctic Ice Sheet, to name but two. The revision of sea-level rise of up to 2 metres by 2100; but the Australian government is stuck on 1.1 metre and state governments are back-pedalling on an 0.8 metre standard because of effect on some coastal property values. IMHO even 2 metres is too conservative, for the reasons articulated by James Hansen. Establishment of “safe boundaries” approach to the planetary system at less than 350 parts per million (ppm) atmospheric carbon dioxide, compared to today’s level which is nudging 400 ppm. Advocacy of the 350 target, but even this is too high since 350 ppm at equilibrium is warming of 1°C, and we can now observe at just 0.8°C warming that significant tipping points have been crossed or are at hand. The application of carbon budget approach developed by Potsdam Institute shows that even for a 2°C target a delay in reaching peak emissions till 2020 then requires a maximum emissions reduction rate of nine per cent per year. But establishment of the 350 benchmark shows a need for emission levels to fall of a cliff and establishes need for large-scale drawdown of atmospheric carbon. Are some in our science community concerned that educating politicians and the public about this post-IPCC-2007 frame is politically counter-productive because it paints the current climate legislation as puny and largely irrelevant to the urgency of the problem at hand? A forthcoming Climate Commission statement on the latest Arctic developments is expected to present the full range of peer-reviewed research and expert elicitations. It is hoped that the wider implications for policy-makers of an ice-free Arctic in a decade will be explored. This is essential because there is no indication that either of the major parties have a clue about this post-IPCC science frame. Nor are there many signs of the major environment and climate advocacy groups incorporating this understanding into their public communications. Most of their campaigning is stuck in the IPCC 2007 frame. Is this another form of climate science denial? Not the denial of the Murdoch press and the Moncktons and Plimers, but the denial of those who for the sake of political convenience live in a bubble of outmoded policy frames that have been superseded by the pace of events in the real, physical world.